Talking with Coventry Telegraph Boxleitner wouldn’t commit to an appearance in the next Tron film. The actor from the original “Tron” is now part of the animated series “Tron:Uprising” and gave some thoughts on that project as well. 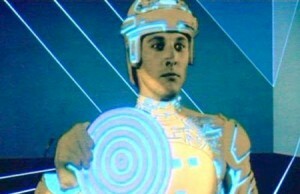 When asked if his “Tron” role brings him the most recognition, the actor explains that the setting matters most. The guy seems generally awesome but he must not get many requests for scifi conventions if he doesn’t even think to mention B5.. Which is sad because he was awesome and it was an awesome show! Dont forget his 4 years on Babylon 5. That show made him a csifi god equal to William Shatner. I miss Babylon 5. He is my favorite actor ever. He’s always had this humbleness about him in the characters he plays. Why did they cancel the toon just when things were getting very interesting. I always want to say he is my favorite actor ever, but then I try to make up some excuse why he is just in my top 5. The show isn’t officially cancelled yet. But I agree, everything was getting very interesting. I didn’t realize Terminal was the season finale until after I watched it. Things are literally just starting. They spent the 1st season character building and now CLU shows up. This show is already great and season 2 is going to make it legendary.